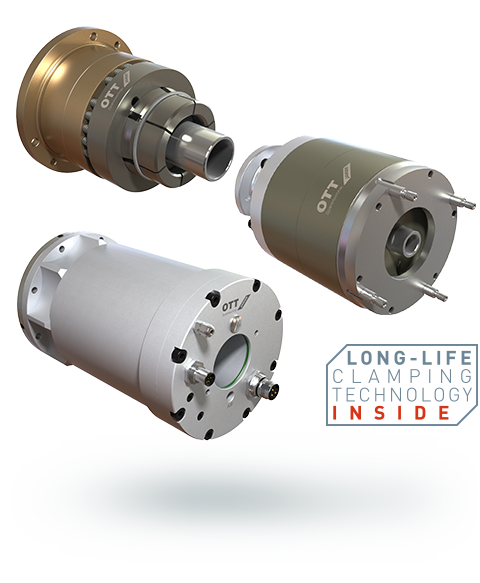 Unclamp Units for Motor Spindles | Advanced Machine & Engineering Co.
OTT-JAKOB clamping systems work through spring force. External force is therefore required in order to unclamp the clamping systems and release the tool. The necessary amount of actuating force depends on the size and technical specifications of the clamping system. In order to reach an optimal compromise between size and necessary release pressure for all clamping systems, our unclamping units are available in several sizes. Depending on the type, our unclamping units are available with spindle bearing relief. The intelligent actuating mechanism with grippers minimises the spindle load, which contributes to significantly lengthening the life span of the spindle bearing. Selected variants can be equipped with a signal ring monitor. This allows the user to precisely define the clamping statuses ‘Unclamped’, ‘Tool clamped’ and ‘Clamped without tool’. The unclamping units feature extended grippers in order that the signal ring connected to the pulling head can be reached by a proximity sensor. Numerous OTT-JAKOB unclamping units can be connected to the electronic position monitor INWEST, which can transmit the exact position of the clamping system to the machine control system in analogue or digital format. The piston monitoring system KAS can optionally be added to our unclamping units. This allows the user to identify the position of the release piston. This effectively prevents the piston from coming into contact with rotating machine elements. Many OTT-JAKOB unclamping units feature a connection for a separate cleaning air supply.